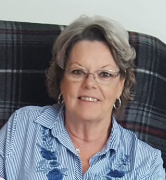 Diane Newell Phifer, 68, of Marshville, returned home to be with the Lord on February 8, 2019 following a brief illness. She was surrounded by her loving family at Levine Dickson Hospice House in Huntersville. She was born in Mecklenburg County to the late Richard Dan Newell and Betty Lou Clark Newell. Diane was a long time member of Thrift Baptist Church in Charlotte. Diane gave birth to her beloved son on April 21, 1986. Anyone who knew Diane knew Eric. Eric was the apple of her eye and her greatest achievement. Diane met Larry in 1979 and stayed friends throughout the years. In September 2013 Larry and Diane married and spent five wonderful years together. Larry and Diane enjoyed going on road trips and spending time with their friends. In September 2017, Diane got to watch her son marry the love of his life and the woman Diane had prayed for for her son. Cortney was the daughter she never had and she loved her dearly. Diane spent her life caring and cooking for other people. She was a kind hearted, loving, and giving person. Anyone who spent time around Diane loved her immediately. When she married Larry, she became a step grandmother to seven grandchildren and thirteen great grandchildren. She loved each and every one of them as her own. Those left to cherish her memory include her husband of 5 years, Larry Phifer; her son Eric Alwran and his wife Cortney; a brother Danny Newell and his wife Shirley; her aunt Margaret Anthony; stepdaughters Lisa Harmon, Sherri Leason, and Stacy Riggins; seven step grandchildren; thirteen step great-grandchildren. A funeral service to celebrate her life will be held at Noon on Wednesday, February 13, 2019 at Thrift Baptist Church, 8415 Moores Chapel Road, Charlotte. The family will greet guests beginning at 10:30 until the funeral hour. Interment will follow the service at Hillcrest Gardens Cemetery, Mount Holly. In lieu of flowers, memorials may be made to Hospice and Palliative Care Charlotte Region.